Shelby McFadden is a graphic designer, illustrator, and entrepreneur who resides in a small town located between Baltimore, Annapolis, and Washington D.C. She graduated from Kutztown University of Pennsylvania in 2011 with a BFA in Communication Design with a concentration in Graphic Design and Advertising Design. She has a passion for art and design, and she feels imagination and creativity are what feeds the soul. With her mom’s influence, she grew up loving all things weird, nerdy and... “old.” Movies like Star Wars, Fright Night and Labyrinth are her top favorite movies to watch on repeat. You can often find her listening to David Bowie, The Rolling Stones, or 80’s artists like The Cure and Echo & the Bunnymen. Her favorite time of year is fall and Halloween season, and she is a big collector in Halloween antiques. For fun, she browses antique shops and yard sales, reads tarot cards to her friends, and plays Super Nintendo. She finds her interests influence her work and her love for everything weird, wild, and wonderful. You have a background in art and design. What inspired you to start Pikchur Magazine? I have worked professionally as a graphic designer for nearly a decade. I am very fortunate to work in a field that allows me to be creative and help others to become successful in their personal and professional endeavors. However, the difference, in my opinion, between being a graphic designer and being an artist, is that graphic design can sometimes limit your creative freedom. It can strip away at your creative spirit, and the end result isn’t always a reflection of you, because you’re designing for the client and not for yourself. I grew up as an artist. Everything I created in my sketchbooks was 100% controlled by my thoughts, feelings and emotions. Since graduating from college nearly a decade ago, I have been so engrossed in work and design, I realized I forgot what it was like to draw and illustrate for myself. What I love most about drawing is sitting with a blank piece of paper and a pencil and no one can tell me to set limits or boundaries. I can create anything I want from the abyss of my imagination. I forgot about my “weird side,” as I like to call it. The side that was me. The side that David Bowie taught me it was okay to be different. The side that said you can be a weirdo and dress-up with zombie makeup and go to Walmart with your friends for something to do. The side of me that missed escaping the real world and diving into my sketchbook to explore the many realms of my imagination. I missed being an artist. With over five years of editorial experience, I knew I wanted to create a publication that will inspire others and bring people together. I wanted to share my personal love for the strange and bizarre, and embrace the side of me that fell dormant for some time. I want PIKCHUR Magazine to be a place where people from around the world can embrace their “weird side” and aren’t afraid to be themselves. I want to create an art community where up-and-coming artists and professional artists can discover and inspire one another. One of my favorite things to hear are artists reaching out and telling us thank you for what you are doing, because we could introduce them to other artists and get inspired. I love that. 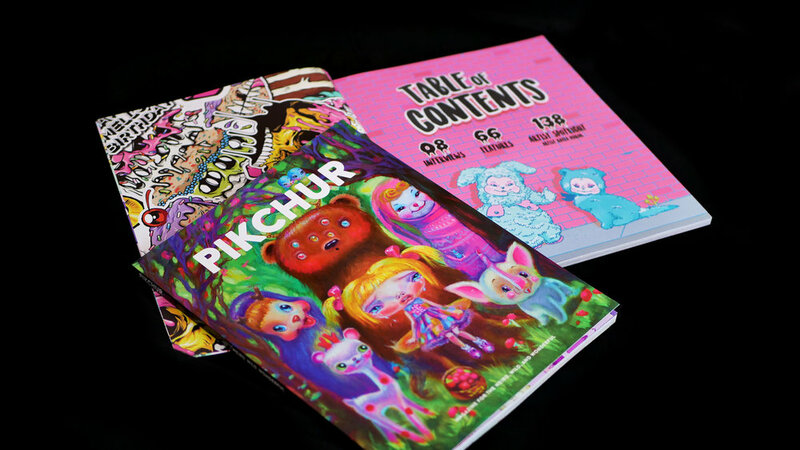 PIKCHUR Magazine is a publication that sets zero limitations to creativity and imagination. Be as weird, wild, or wonderful as you want your art to be. Without anyone saying, no. Share your creative journey with us briefly. My creative journey started when I was really little. I have pictures of myself under the age of four years old painting and coloring at my family’s kitchen table. I was always that person who created comics about me and my friends in spiral bound notebooks. I am pretty sure my school notes were more illustrations and less note taking. I was voted “most artistic” in school, always going above and beyond on school projects, and getting excited about art class instead of physics or mathematics. I was fortunate enough to receive art scholarships for school and my projects were nominated for design awards. I went to a fantastic University and was taught design by talented design professors. After I graduated, I worked for several large and small companies, working on an array of projects, from branding large shopping malls and mixed-media establishments all around the world, to creating patterns for tech accessories sold in large-scale retail stores in the United States. I somehow evolved from the little girl sitting in a high-chair painting on paper, to a professional graphic designer who now owns her own design company. I consider my creative journey a rough road. My self-esteem was on a teeter-totter for many years, full of highs and lows. I never knew how my days working as a designer would go when I stepped through the office doors at 8:30AM. I met challenges through work and the people I worked with. I listened to criticism and I stood behind my opinions. I listened to sexist remarks by men who fueled their egos and I comforted peers who were bullied by female art directors on power trips. However, I wouldn’t change the rough road for a smooth-paved highway. It gave me the drive to quit working for someone else, and start working for myself. In the early months of 2016, I began freelancing, which later turned into my design company. I’ve built relationships with new clients I love and learned a lot along the way. Why do you think print media is relevant and important in today’s digital world? What draws you to it personally? Print media, what I believe, will always be around. I think people were nervous it would die-off now everyone owns a smartphone or tablet of some kind, but I believe there are people out there, who still prefer turning pages than scrolling up with their finger. Print and digital are two different experiences. Print is more personal. It’s like talking to someone in person over a cup of coffee versus talking to them over facetime. It’s the energy of being face to face with someone that makes the conversation experience different. One of my favorite past times is going to the local Barnes & Noble, grabbing a stack of magazines, and sitting in the cafe with a cup of coffee. Though, the cost of print is far more expensive than downloading an entire publication instantaneously, I will always be the person who collects print materials, whether it be magazines, stickers, journals, or posters. I love holding something in my hands and feeling the textures of the materials, and even stumbling upon it on a coffee table or on my computer desk and feeling the excitement all over again. What should readers expect from upcoming issues of the magazine? I think this issue will come as a shock to a lot of readers, as it is our first issue of PIKCHUR Magazine... and it looks so damn good! Our team has been working really hard, and I am SO excited about it! I really wanted each issue to tell it’s own story and I think we really nailed it. Not only a chance for us to showcase really awesome work from other artists, but for us to really have fun with the layouts and the flow of each page, while also maintaining consistency. Name a few of your favorite print publications. Aside from Create! Magazine being at the top, I am also a big fan of popular magazines such as: Juxtapose, Hi-Fructose and Bon Appetit! Some of my favorite indie magazines include: Lunch Lady, Frankie, and Popshot Quarterly. I also recently discovered So Young Magazine, an awesomely illustrated, new music magazine! As an independent magazine, we are always curious to learn how other publishers operate. Join us as we select a few of our favorite creative titles and pick their brains about their projects. We hope that these features inspire you to create your own zine, book or blog! Personal, visual, poetic, current and innovative, DOG offers original content and a new perspective to dog lovers and owners. Content for DOG will come from a variety of creative sources mirroring the diversity of dog owners and lovers. Submissions from emerging or established photographers, designers, illustrators, writers, designers, makers and visual artists, and any dog owner, give DOG a fresh vision of what dog mean to humans. What initially inspired your publication? My passion for independent magazines was how things started, I wanted to be involved in any way and someone suggested start our own magazine. Then the next question was, a magazine about what? I looked around and saw my dogs and questioned, what about a dog magazine? And that is how everything started. As an indie magazine, we are always excited to learn about what goes into the production of each issue. How do you gather content and decide on what dogs to feature? We look at two elements when it come which breed to feature next, first its origin, it is interesting place to visit? Will people would like to read about it? And second does the dog has an interesting story line? When those two elements come together, we got our cover girl/boy. Tell us about your team. How many people typically contribute to each edition? Officially we have three in our pack. We are a very small team , we have our Editor Emily Rogers, our Editorial Assistant Hannah FitzSimons and me, who puts the magazine together. Then we have collaborators from around the word like writers, illustrators and Photographers. What do you hope the readers take away from DOG? We want our readers to have fun with our magazine, to read what we write and to learn a bit more about dogs, specially about the specifics of each breed. Sometimes people get dogs just because they look cute without knowing the dog’s temperament or other characteristics that might not be suitable for your lifestyle. What is your favorite part about publishing a magazine? My favorite part about publishing a magazine is that I get to work with so many creative people, people around the world who somehow have inspired us with their work. What advice would you give someone who wants to get into indie publishing? My advice will be to be different, have a strong concept, do your research , look for similar magazines are out there and see what they are doing, and then do it even better. Create content that has a meaning and a reason behind it. When we get our two issues printed. That is our highlight of the year, to see it in front of us.